One really popular drink especially during the hot summers in India is a Lassi. A lassi is nothing but fresh yogurt sweetened to your liking and top with a dollop of cream. I like mine without the cream. Its refreshing and healthy. Restaurants here serve two varieties a sweet and a salty lassi. I've never tried the salty variant, I don't think I'd like it. Summer seems to have found its ways here a little to early. Its as hot as it would typically be during the peak of summer in the month of May. I can only imagine what May will be like. What better way to cope with the crazy heat than a delicious, cool, fruity lassi. Surprisingly the only fruity yogurt we can find here is processed and honestly, doesn't even taste like yogurt anymore. 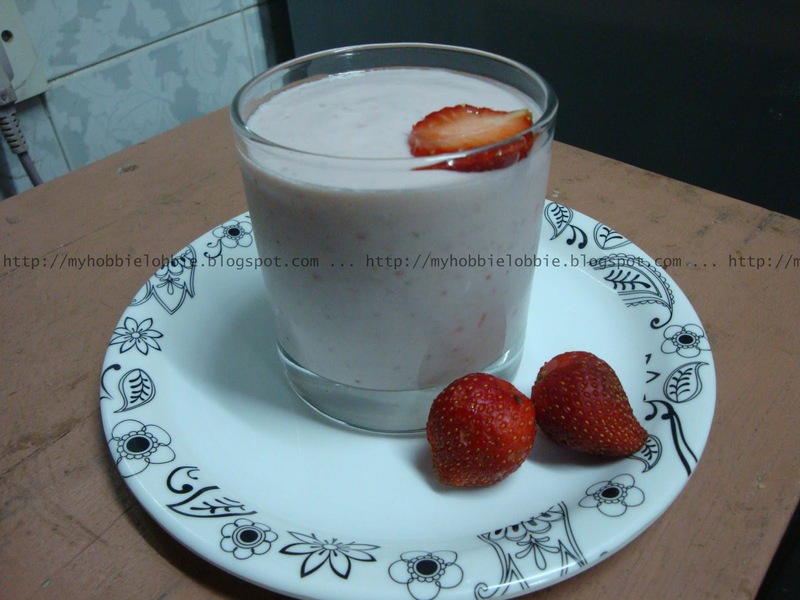 I'd picked up a whole bunch of strawberries on our last trip to Panchgani and decided to add a few to the lassi. The result was delicious, refreshing and as REAL as real food gets without any funny stuff (read preservatives etc.) added to it and its so simple to make. I used fresh strawberries since they were in season but I'm pretty sure frozen berries will do just fine as well. You can opt to use a sweetener of your choice or if you prefer you can leave it out altogether. Place all the ingredients in a blender and blitz till is well incorporated. Yummy Lassie, dear! Happy Holi! Oh, I got quite a few strawberries on sale at Kroger this past week. Definitely need to make this! Wish you a happy holi too Priya and Reshmi! What a cool drink! Thanks for linking this up to Sweets for a Saturday. I love yogurt and this smoothie looks perfect! My girls would just love this!!! I can't wait until I can find strawberries at a good price. I know they will Jia!